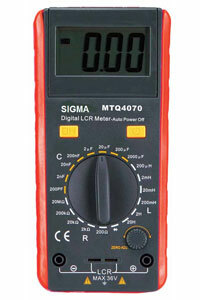 Professional Grade Digital LCR Meter. Data Hold facility & MAX Hold facility. Polarity : Automatic, positive implied, (-) negative polarity indication. Over range Indication : 'OL' or '-OL' is displayed. Operating Temperature : 0°C to 40°C, < 70% R.H.
Power : Single, Standard 9V battery. Measurement Rate : 2.5 times per second, nominal. 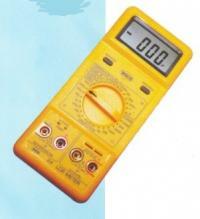 Diode Test, Capacitance Test, Resistance & Inductance. Accessories : Test Leads, Carrying Case, User Manual, Battery, Tilt stand. Including : LED, Microwave Diode & Zener Diode Test. EN61010-1 Approval Protection Class II, Pollution Degree 2. Ohm, Diode, Continuity and Frequency Input Protection. Overload Protection : 500V DC or AC rms on 200mV range, 1000V DC or 750V AC rms on all other ranges. 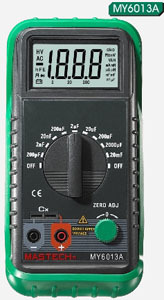 Continuity diode test , Low battery indication , 9V battery power supply .